Aaj hum blog me web push notification lagana sikhenge. Push notification on web se blog ka traffic increase hota hai. Kyoki ye user ko target karke notification send karta hai. Is post me hum batayenge ki web push notification kya hai aur blog me web push notification service kaise setup karte hai. Bahut si website free push notification to web browser ki subidha bhi dete hai. Blog me web push notification php ke bahut sare fayde hai. Ydi apko iske fayde pta chal gye to 100% jarur apne blog me web push notification software lagayenge. Apne kai aisi website dekhi hogi jisme bell icon bna hota hai. Jab us bell par click krke subscribe karte hai to wo us blog se realated notification send karne lagta hai jise web push notification ke name se jana jata hai. Web push notification ka matlab aise notification se hai jo web se bheje jate hai. Aur inhe touch karte hi ye website ki other post ko open kar dete hai. Kisi browser ko target karke send karne wale notification ko web push notification kahte hai. kai apps se isi prakar ke notification aate hai. Kai app jaise uc news, news dog ke bare me apne suna hi hoga. In apps se bhi notification isi prakar se aate hai. Ye web push notification examples hai. 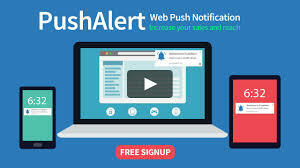 Web push notification tabhi user ke pass jata hai jab wo use subscribe kar leta hai. Isliye ye notification user friendly hote hai. Aur is prakar ke notification ko sabhi log like bhi karte hai. Kai bdi website web push notification ka use karti hai aur isse bahut sara traffic bhi collect karte hai. Blog me web push notification free add karne ke liye apko neeche diye gye steps ko follow karna hoga. Ye steps blogger aur wordpress dono website ke liye same hai. Sabse pahle push engage ki website me jaye. Aur ab yha apko isme Sign Up karna hai. Sign up karte samay email address , website url, subdomain and password apse puchh jayega. Is field ko correct fill kre. Ab apko start a free trail ki blue button milegi usme click kar de. Ab apke samne installation setting ka ek page open hoga jisme apko apni website se realated sahi jankari fill karni hai. Isme apse website ka name, url aur website logo puchha jayega jise fill krke update me click kar de. Ab apko website page ko refresh or scroll down karna hai. Ab install push engage jawascript code wale option me jaker click karna hai. Ab apke samne ek jawa code show hoga jise apko copy kar lena hai. Ab is code ko Blogger or Wordpress Blog me <head> tag ke bad ya </head> tag ke pahle apni blog theme me paste karna hai. Iske bad theme save kar de. Web push notification ko stylish box me show kar sakte hai. Iske liye push engage website 4 dailoge box choose krne ki subidha deta hai. Chaliye ise step wise set kre. Sabse pahle push engage dashboard me jaye. Ab subscription dailog box settings me jaye. Ab degine aur dailoge box choose kre aur setting update kar de. Ab apka web push notification dailoge box setup ho chuka hai. ab apka web push notification website me to add ho gya hai. But usse new notification send karna bhi bahut jaruri hai. Iske liye ye steps follow kre. Sabse pahle push engage website ke dashboard me jaye. Ab new notification per click kre. Ab apke samne ek page popup hoga jisme jo notification send karna hai uski detail bharna hai. Is page me apko notification title, massage aur url dalna padta hai. Url post ka dala jata hai. Ab settings update kar de. Ab apka notification apke subscribers ke pass pahuch jayega. Ummid hai ki apko Blog ki ye web push notification tutorial pasand aaya hoga aur apne ise blog me add kar liya hoga. Ydi isme koi problem aaye to comment kre. Hum jald hi apke sawal ka jawab denge.